The true history of Tasmania’s famous scallop pies is shrouded in mystery. The earliest reference I can find to the traditional pie, containing scallops in a creamy curry sauce, is less than complimentary. “I bought two scallop pies for 10d. (tenpence) each and found one little scallop in each, with about half a teaspoon of curry. There appears to be about 300 p.c. profit on each pie,” complained BITTEN of Glenorchy. 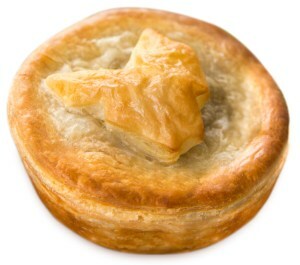 In Australia, the scallop pie is more or less unique to Tasmania (with a few notable exceptions: Victoria’s Apollo Bay Bakery apparently does a good one). It’s not clear, though, who first conceived the idea of shrouding the scallops in a creamy white sauce liberally dosed with curry powder and wrapping them in flaky pastry. At least one writer has said: “Local lore has it that Tassie’s pie tradition evolved in the early 1800s, when scallops were sold for a shilling a bucket on the Hobart wharves.” If this is, indeed, local lore, it’s pure fantasy. For a start, the scallop industry didn’t get going in Tasmania until much later in the century. And according to a Hobart local, his father was buying a bucket of scallops on the wharf in the 1950s. What’s more, an essential ingredient in the pie (as we shall see later) wasn’t invented until the mid-1800s. In his English and Australian Cookbook, published in 1865, Hobart gourmand Edward Abbott gives the scallop short shrift. He includes no recipes for the shellfish, but mentions them in his list of Tasmanian fish, saying simply “similar to those caught in England, plentiful on the sandy beaches but rarely brought to market”. However, in 1890, although the first scallop beds in Sandy Bay near Hobart had been exhausted, new scallop beds were discovered in the Derwent River. The Tasmanian News reported that the new beds “will be remunerative to fishermen if properly worked, and in addition supply the market with a luxury which it has been deprived of for many years.” The same article opines that scallops “when stewed in the same manner as an oyster…are deemed a delicacy by epicures”. By the mid-1890s, the scallop had evidently been embraced by the local population to the degree that, in 1896, the Commissioners of Fisheries decided to declare a closed season for scallops from 1 November to 31 March. The following year, further regulations were introduced: the scallop season was to run from 1 May to 30 November and a minimum size for harvestable scallops was introduced. In 1901 a bag of 50 scallops was selling at the market for sixpence. There was still no mention of scallop pies, but the union of the shellfish and curry sauce came early. In 1920 a dish of curried scallops on the shell was hailed as Tasmania’s “national dish“, one that would be “held in fondest memory” by any visitor from the mainland. Another visitor, in 1933, wrote humorously about the determination of Hobart locals to thrust their famous shellfish upon any mainlander passing through. This time scallop pie was mentioned. However, it was unlikely to be the dish as we now know it. Through the 1930s and ’40s, many scallop recipes were submitted to newspapers for publication, including several for scallop pie. These recipes call for the scallops to be layered in a baking dish with a creamy sauce, breadcrumbs or, in one case, bread and butter, and baked in the oven. This type of scallop pie is not unique to Tasmania. There are similar dishes in Ireland and the US state of Maine, although the Irish scallop pie is topped with potato. The ’30s and ’40s were surely the heyday of the scallop. The scallop beds of the D’Entrecasteaux Channel were yielding vast numbers. Henry Jones IXL was even canning them by 1935. In 1938, 18 million scallops were consumed. Each year, as 1 May approached, newspapers heralded the opening of the season and called for new recipes from their readers. Scallops were baked, fried, minced and used to fill savoury puffs, served on the shell in cream sauce or even, perhaps a fore-runner of the pie, wrapped in pastry and deep fried. By the early 1950s, pastry had made an appearance in recipes for open-top “Creamed Scallop Pie”. Recipes for devilled scallops appeared frequently, the resulting dish sounding very much like the filling of today’s scallop pies. An essential ingredient for devilled scallops was curry powder. Not just any curry powder; it had to be Keen’s Curry. Invented in the 1850s by Joseph Keen, who happened to live in the Channel country so famed for scallops, this Tasmanian product is still essential to the taste of your genuine Tassie scallop pies. Today’s scallop pies are judged by the number of scallops they contain (ideally five or six, complete with the orange roe). There are a number of commercial bakeries producing them, but many of the best are produced by small bakeries throughout the island state. The Harbour Lights cafe on the Hobart wharf is well known for their pies, which have been on the menu since around 1973. Scallop pies, with their local shellfish and locally-invented curry powder are a truly regional dish. Tourists in Tasmania might take the advice of that 1933 visitor who had tracked scallops down to a fish shop where they were sold for fourpence a dozen fresh or a shilling and sixpence for a plateful, fried. “Whatever you do, never let it be said you left Hobart without sampling the aforesaid scallops, ” he wrote. Now available in a convenient pastry shell.